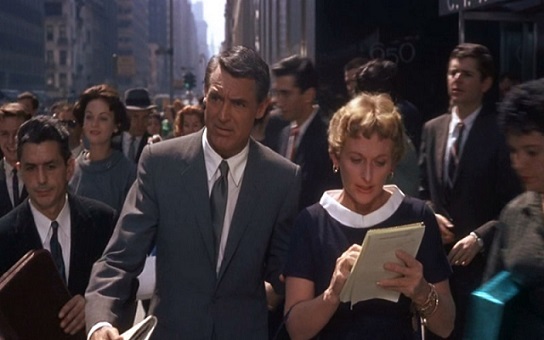 The recent idiom of calling a guy a ‘suit’ if you don’t like him, consider him a flunky or a waste of space, applies to Cary at the beginning of the film: this suit comes barrelling out of the elevator, yammering business trivialities a mile a minute, almost with the energy of the entire building. The suit… [is] a real beauty, a perfectly tailored, gracefully falling lightweight dusty blue… It’s by far the best suit in the movie, in the movies, perhaps the whole world. observations: Two happy chances led to this entry. When I featured Todd McEwen’s Five Simple Machines recently, with a picture of Killer Barbie, his publisher Charles Boyle at CB Editions told me about this essay, published in a Granta travel writing edition a few years ago. I absolutely loved the essay, and then while looking for a film still, came upon the completely amazing Clothes on Film website, which I strongly recommend anyone with the slightest interest in clothes or films should visit immediately. It’s possible I’m prejudiced in its favour, this being a subject so close to my own, and to my heart - but no, I think anyone would enjoy a turn around this site. [Grant] looks like he’s been teaching school all afternoon… his tie is still pressed and the shirt is white, even the collar and cuffs. You cannot violate the white shirt of the Sixties. You might kill me but you will never kill this shirt. And he continues to track the clothes in the film - Mount Rushmore seems ‘a very formal national park, there were a lot of people dressed up in the cafeteria’. Links on the blog: Todd McEwen here. In Strangers on a Train (1950), a character chooses a glen plaid suit, as mentioned above, and for the entry there is a fine illo featuring a young and handsome Frank Sinatra, a man nearly as stylish as Cary Grant. The two stills from North by Northwest are, of course, from Clothes on Film – their article on this film is well worth reading in parallel with the McEwen. I thought the essay was very clever, because it was hilariously funny, but the points he was making were valid, and imaginative, and made sense. I heard somewhere that the author is going to write more about films, and I'll certainly be looking out for that. Oh that's interesting. Look at it again and share some details! As the editor in "His Girl Friday," when Grant is threatened with prison by the mayor and the sheriff, he yammers out, "The last man to say that to me was Archie Leach, just a week before he cut his throat." This essay will be included in Todd McEwen's forthcoming book of essays, How Not to be American, to be published later this year by Aurum Press, London. Thanks - I'm most certainly in line for that. You are introducing me to so many new things today. Don't know much about Todd McEwen either. 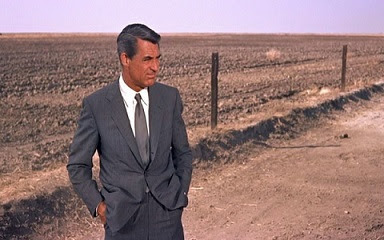 Cary Grant is a favorite actor, along with James Cagney, and North by Northwest is a movie we watch over and over. Yes I love Cary Grant too, this film and His Girl Friday particularly. But plenty of others too. And James Cagney did some great ones too.